A stubborn Eaton Bray lower order saw Milton Keynes fall eight points adrift of Four Counties Division 1 leaders Thurleigh. Early rain in Milton Keynes threatened to put the game to bed before it even got going, but patience prevailed and the match went ahead, albeit shortened to 40 overs aside. But it was a tough beginning for the visitors as Nimesh Chavda and Nick Hillman got their feet under the table. The pair put on 58 for the opening wicket, with Hillman falling for 35. 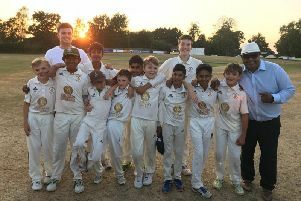 When Chavda fell for 25 with the score on 87, it sparked a mini collapse for the home side, who soon found themselves 94-4 as James Flecknell and Nick Pearson began to find their groove. But in bringing Grant Ebrahim to the crease, Eaton Bray were soon given the runaround by the MK batsman. He fired a rapid 59 not out from 47 balls, which featured six boundary fours and two maximums as he carried the score to 184-6. Both Flecknell and Pearson finished with three wickets apiece. Chasing 185 for the victory, Bray were on shaky ground from the off, thanks in large part to MK bowler Brian Tompkins. Tompkins took out opener Joe Roff without troubling the scorer, before Flecknell exited not long after, leaving the visitors 19-2. Skipper Josh Peacock and Jonathan Marum too were quickly back in the pavilion courtesy of Tompkins (3-26)with Bray’s score reading 32-4 and staring defeat down the barrel. But Sam Slatter and Joe Braddon mounted a fine recovery for Bray, dragging the scoreboard along with them. Braddon’s eventual dismissal came with the visitors nearing the 100 mark, having scored a patient 35. Slatter, meanwhile, appeared even more patiently and intent to rescue the draw, held on for his unbeaten 31. Chavda, who’d taken care of Braddon added Lee Gauntlett and Jaco Jacobs to his list on his way to 3-15, but the reduced overs would save Eaton Bray, but cause frustration for MK. The visitors would in the end close on 133-8, never troubling MK’s total but in preventing them from taking full marks from the encounter, helped Thurleigh extend their lead at the top of the charts to eight points.